Home » No-Cry Potty Training » Potty Training Praise – How Much is Too Much? Potty Training Praise – How Much is Too Much? It is hard to know what praise strategies you should use when your child is learning to use the potty. Should you give lots of applause and compliments? Should you show simple, matter-of-fact acceptance? 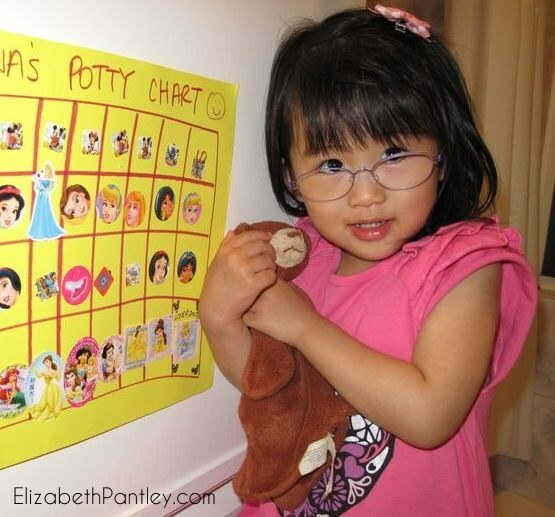 What is the right response to encourage potty training success? Researching this question doesn’t get you very far because both sides of the camp are very adamant about their opinions. Some experts say that you should absolutely give tons of positive feedback and turn potty training into a party – noisemakers, treats, songs and prizes. However, other experts say that you shouldn’t get overly emotional or excited and simply acknowledge that your child has done well. If you have been reading my work for a while, you probably know what I’m going to say: you should choose whichever method works best for you and your unique child. Some parents are naturally more enthusiastic, while some are more reserved; and the same thing applies to their children. Some children thrive on energetic liveliness and will do anything to be the center of attention. Yet other children can be more reserved and tend to be easily overwhelmed. Do what comes naturally for you, and take your child’s personality into account as well. Teaching your child how to use the potty can, and should, be as natural as teaching him to use a spoon, do a puzzle or anything else. You have helped your child learn how to walk, build block towers, and use sippy cups, so potty training is just another step in this journey. You do not have to over-think every detail of potty training – just like you wouldn’t over- think every detail of teaching your child how to build a block tower. Probably the best advice is to do what comes naturally and what encourages your child to keep trying. What’s most important is that you want your child to know that you support him, and that you are proud of his efforts along the way, as well as his successes. This support could come in the form of cheering and high fives or a quiet, calm assurance. You may not want to hear this, but on average, it takes three to twelve months for a child to achieve daytime toilet independence. How old a child is when they master toileting has nothing to do with their intelligence or future abilities. It has more to do with readiness skills and physiological factors. If you wait until your child is ready, the potty training process is likely to go much more smoothly. Children are only little for a very short time, and they all mature on their own unique timetable, so there is no need to rush the potty training process. This should not be a stressful or frustrating experience for you or your child. Instead it should be a relaxed and maybe even fun event. So work together as your child learns new toileting skills. Be patient, and enjoy helping your child master this milestone.